This Multistate Health Care Advance Directive is as "universal" as any form can be, considering we are a nation of 51 sovereign jurisdictions. Each state has its own advance care planning laws, so there is a variety of Living Wills (instructions for care), Durable Powers of Attorney for Health Care (the appointment of a health care proxy) and "combination directives" that serve both functions. This Multistate Health Care Advance Directive is a "combination directive." States where this Health Care Advance Directive may not be applicable. The laws of some states mandate the forms and/or language that must be used for Advance Care Planning documentation in those states. 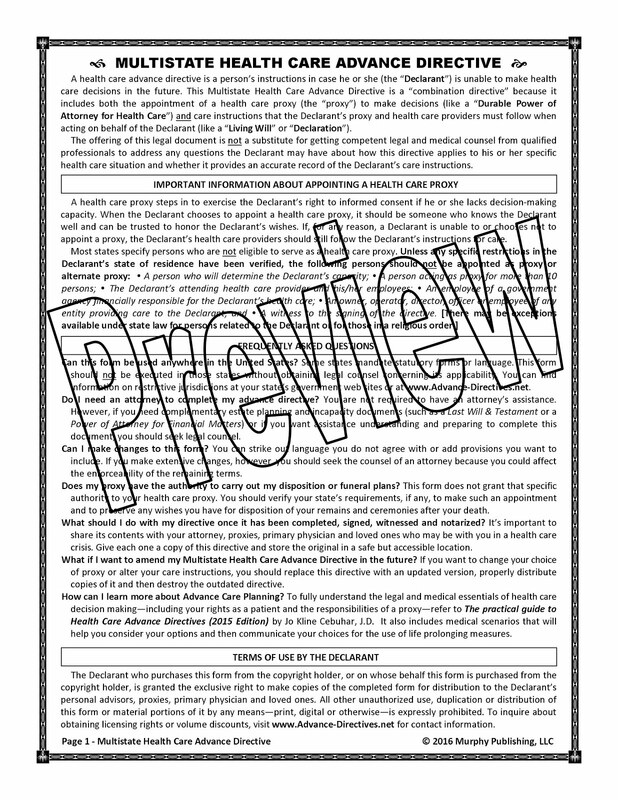 Residents of the following states should not use this Multistate Health Care Advance Directive form without the assistance of an attorney who is familiar with Advance Care Planning documentation, to avoid creating conflicting provisions that may render some or all of the directive void: Alabama, Indiana, Kansas, Kentucky, New Hampshire, Ohio, Oregon, South Carolina, Texas, Utah and Wisconsin. Mandatory disclosure or witness statement. If you reside in a nursing home or care facility, a mental health facility or a facility for the intellectually disabled in one of the following states, you should obtain the mandatory disclosure or witness statement from your state bar association, attorney general's office or health department to attach to this Health Care Advance Directive: California, Connecticut, Delaware, New York and Vermont. States where notarization is required. Many states offer the option to have a directive either witnessed or notarized. This Health Care Advance Directive must be notarized if executed in the following states: Missouri, North Carolina, South Carolina and West Virginia.